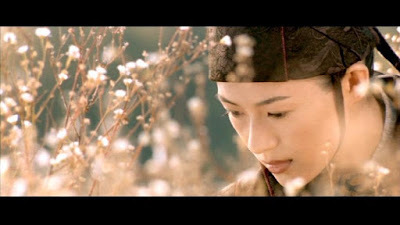 For many, not seeing a film like House of Flying Daggers would not be considered strange as I would imagine that even at it's peak of popularity, Chinese wuxia cinema wasn't exactly something embraced by a majority. For me though, after over a decade since its release, the fact that I was finally experiencing this exciting and literally colorful movie seemed hard to believe. I love wuxia. The style, the surreal action, the melodramatic performances that somehow fit the overall tone perfectly. 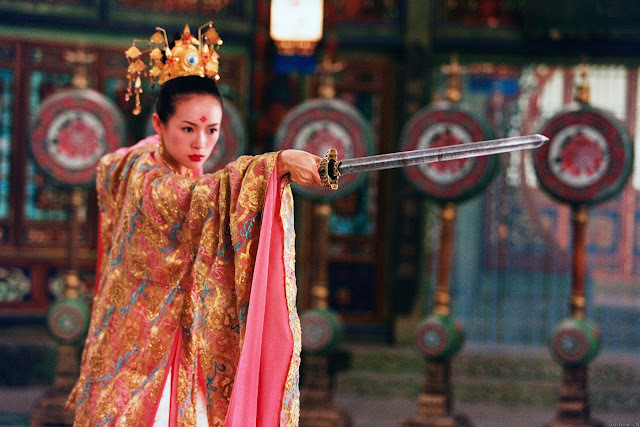 House of Flying Daggers has it all, and while the lackluster storyline leaves plenty to be desired, the costumes, the set pieces, the vivid usage of color and the spellbinding cinematography completely made up for any flaws and created a joyous cinematic experience. During the final act of the film, I pretty much disregarded the dialogue entirely and simply got lost in how unbelievably gorgeous the sight of snow falling on an aggressively windy day is. The result is pure magic. I know that seems like a major flaw, that the dialogue took a massive back seat to the aesthetic, but the feeling flowing through my eyeballs in that moment can best be described as orgasmic. I need to seek out other films from this genre I may have missed along the way. House of Flying Daggers isn't a perfect film, far from it actually, but if it were a tub full of water I would bathe in it.